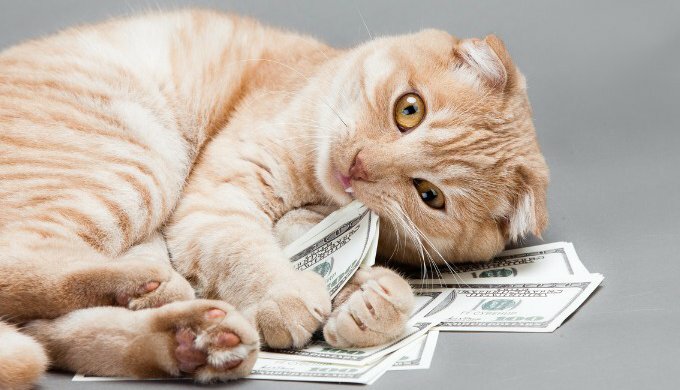 How much does a cat really cost? In this article, we'll not only look at the price of adopting a cat, but also the daily and longer-term costs you may incur throughout their life. So, what is the overall cost of a cat? Whether you plan on adopting a cat from a shelter or buying one from a breeder, it’s a good idea to have thought about your budget beforehand. As with many things, you will need to have a plan in place for both unavoidable and unexpected costs! How much does a cat cost at the time of adoption? If you wish to buy a pedigree cat from a breeder you could be looking at spending between £500 and £1500 - this is the most expensive of the options. The cost will depend on the breed, pedigree, and the breeder you put your trust in. You will want to ensure that the breeder complies with any relevant country regulations, including applying vaccinations and treatments. If you choose to adopt a cat from a shelter, the cost will be far lower. Depending on the history of the cat, and the shelter itself, you may need to cover vet costs including neutering, microchipping, vaccinations etc. This could vary from about £50 to £150 depending on the country, region, and what your cat will require. 'Free kitten to good home' notices have become much more popular in recent years with the growth of social media and internet forums. While 'free' seems appealing, the reality is that it can often be more expensive than adopting a cat or kitten from a shelter where many of the procedures are done on-site at a reduced cost. It can also be risky as you do not know the background or previous treatment of the animal. An unvaccinated, unsterilised, unmicrochipped 'free' cat or kitten can mean an expensive trip to the vet. Litter box: Depending on whether you opt for a litter box or tray, you can expect to pay, on average, between £5 and £25. Litter: There are many litter options available to choose from, and the trick will be to find the best one for your cat. Your vet will be able to advise on the safest and most practical options, however, changing the litter about three times per week should set you back somewhere between £5 and £15 per month. Food & water bowls: Although we'll look at the cost of feeding your cat shortly, it’s important to remember that they will need something to eat and drink out of from the get-go! You can choose chic designer bowls at higher prices or stick with regular ones for under £5, it’s completely your choice. There are also automatic cat feeders on the market and these vary in price depending on the technology used, but can set you back at least £30. Cat carrier: You will need to choose this carefully as safety, quality, and durability are important. It will also depend on the type of use it will get. Carriers can start from around £20 but easily exceed £100 depending on added functionality. Cat tree: These start at around £15 but more sophisticated models will come at a higher price. Some trees can be integrated into the design of your house and can cost up to £200 or more. Bank account permitting, the world is your oyster here. Toys: Cats love to play! It also keeps them stimulated and healthy, but that doesn’t mean you have to spend a fortune. Feathers attached to the end of a piece of string can keep them amused for a long time (you're likely to get bored first!). It's not difficult to make your own toys either: for the creatives out there, you can sew your own DIY easy cat toy (also see DIY - Cat toys and DIY - catnip toy) or for something a little less crafty, a homemade cat box is simple yet highly effective. Collar and tag: You can find out more about cat collars and tags here to help you make an informed choice. A standard collar shouldn’t cost more than a few pounds, and the tag can be engraved for under £10. In a section of its own, cat food is a primary expense that needs to be factored into your budget. Cat food prices can vary dramatically depending on the brand of food, whether it’s wet or dry, quality, and ingredients included. On the whole, a kilogram of cat food can cost anywhere between £3 and £10. It is important to remember that better quality food will help to give your cat the happiest life, while at the same time helping you to save you money on vet bills in the long run. There are many low-cost food options available for your pet, but you should be careful about some of the ingredients in these. Be wary of labels using common marketing terms (e.g. 'premium', 'healthy', 'sugar free', 'natural') or pretty pictures of fresh meat etc. These can be misleading. Additives such a flavour enhancers, colourings/dyes, sweeteners (including corn syrup and sorbitol), and names of ingredients you can't pronounce can also be problematic for your pet. Ultimately, you want to feed your pet a balanced diet that is not too fatty, salty, or sweet. If you're at all unsure, talk to your vet about the best diet to suit your cat's breed, size, weight, etc. And mention your budget so they can best guide you. Vet costs vary from country to country but can quickly add up. Using standard UK prices below, here are some of the costs you may incur as a new cat owner (prices are estimates only and provided for illustration purposes). 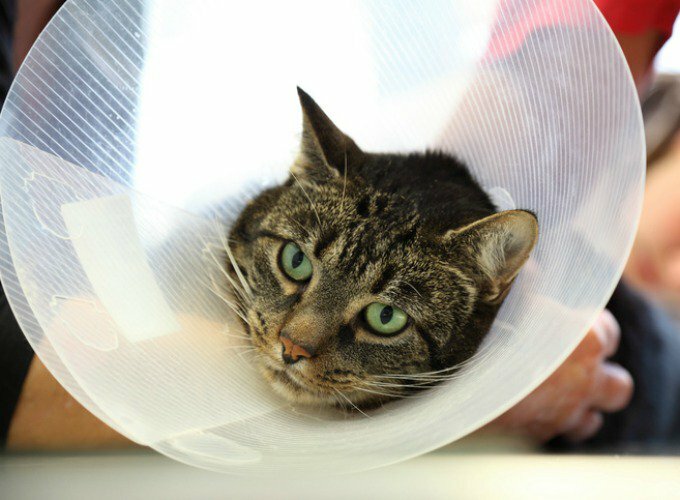 If your pet becomes ill or gets injured, this is where the costs really kick in. Many pet owners opt for pet insurance, which typically starts from around £5 per month. It’s vital to read a policy thoroughly before signing it as it can contain hidden costs or procedures not covered by the insurer. For instance, while some policies state they cover up to £4,000 worth of treatment, this may be capped at £500 per condition! 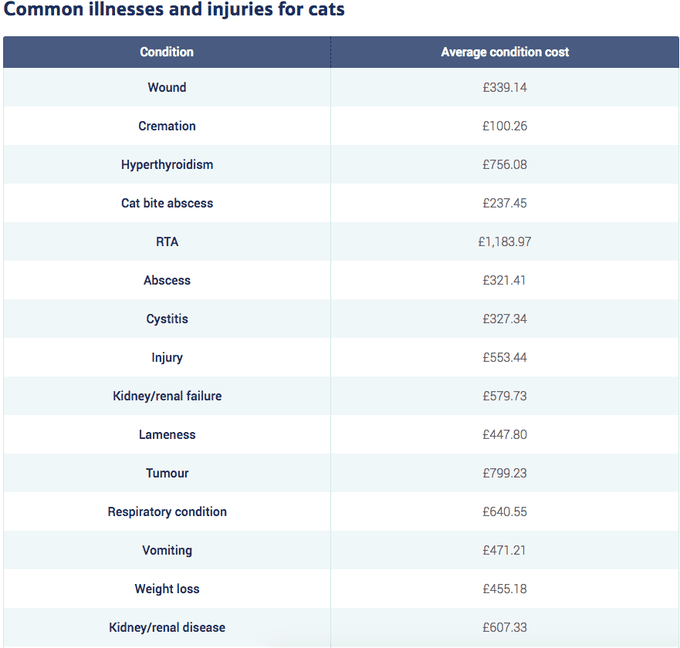 Below is a list of average vet costs for animal illnesses, compiled by Tesco in 2016. Other costs are likely to occur during your cat's life with you, such as cattery boarding costs, flea removal, and/or cat flaps. It is evident that a cat is an investment and adopting one is agreeing to meet their every need. This is something to take into account and be realistic about; if you can’t afford a cat at the moment it's best to wait until you know the timing is right for both you and them. What unexpected costs have you been surprised with since owning your cat? Why do hamsters run in their wheel? Dog sports you may not know about! How do kittens learn to hunt?